Last Thursday, Woodland Park Zoo was recognized by the Seattle Design Commission with a design excellence award for our new Humboldt penguin exhibit! The award is in recognition of Seattle’s best capital improvement projects. 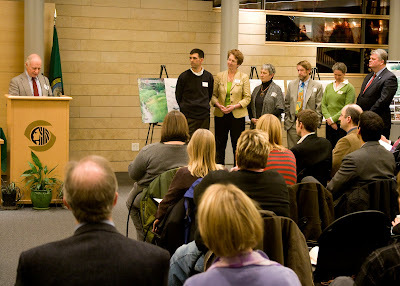 Other honorees were Fremont Peak Park, Thornton Creek, Seattle Center Century 21 Master Plan, and Sound Transit Central Link. Visitors may be fixated on the nose-to-beak views of the penguins in the exhibit, but it’s the harder to see sustainable elements of the exhibit that captured the Design Commission’s attention. With support from Seattle City Light and Seattle Public Utilities, we installed an energy efficient ground-based geothermal heat pump that uses the Earth’s below-ground temperature to keep the exhibit’s water at a penguin-friendly 55 degrees year round, as well as an innovative water filtration system. These features will save nearly 22,000 kilowatt-hours of energy and 3 million gallons of water per year. That’s the equivalent of heating five, new two-bedroom townhouses and saving 24 million pints of drinking water each year. The exhibit is also designed to contain and recycle all stormwater runoff thereby preventing the pollution of natural water sources like Puget Sound. We are grateful to all the supporters who helped make this now award-winning exhibit and its sustainable features possible! Photos: (Top) Woodland Park Zoo and City of Seattle representatives accept the Seattle Design Commission award at City Hall. Photo by R. Scott Vance. (Bottom) A young visitor enjoys a close-up view of a Humboldt penguin. Photo by Jennifer Svane. Great post! I have recently created my own zoo blog and will link to you on my homepage.